Though many people know C&L Landscape Inc. as the landscaping experts in Jacksonville (it’s right there in our name, after all) this expertise isn’t limited to on-land projects. We’re also quite skilled in the execution of marine construction in Jacksonville and would love to be able to give your home its own oasis in the form of a private dock. We have an entire marine construction division that’s ready and waiting to provide improvements to an existing dock that’s fallen into disrepair, or to build you an entirely new dock from scratch! Keep reading to discover three important ways that marine construction of a new dock will help you to get even more joy out of your residence in Jacksonville. When you have to get a trailer involved, boating becomes a chore instead of a fun outing. With your own private dock, your boat will always be ready for you any time you want to take friends or family members out on the water. Waterfront property is nice, but hanging out on the shore will never be as fun as practicing your cannonball in much deeper water. With the marine construction experts at C&L Landscape Inc. in Jacksonville, you’ll enjoy the luxury of your own private diving platform/suntanning spot! 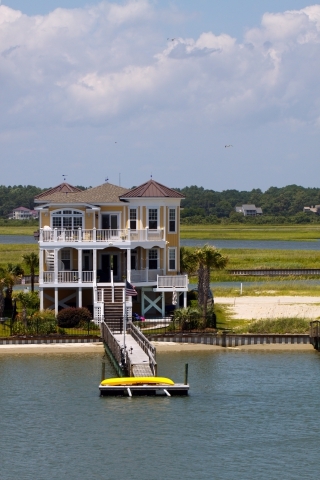 It’s no secret that homes with their own private docks are considered luxurious. If you want to increase the value of your home for future resale, a dock constructed by the marine experts at C&L Landscape Inc. will be a amenity worth spotlighting. Contact us to learn more about your private dock construction options today!